The provider of a state-of-the-art video player that downloads and streams high definition videos onto your TV, Myka has announced its new Myka ION state of the art HD media player, which the company claims as the first Web-to-TV product that able to easily run Boxee, Hulu and more leading Internet video services, utilizing 1.6Ghz Intel Atom 330 dual core CPU and NVIDIA ION graphic processor aimed for unprecedented performance and value. Myka ION is actually a full fledged PC itself, supporting a wide variety of software including XBMC, Adobe FLASH and much more, based on Ubuntu linux operating system. The new Myka ION base model with 160GB HDD is available for MSRP of $379. 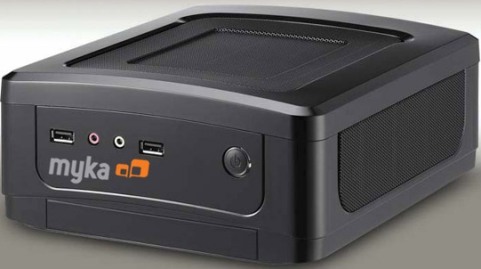 Options of Myka ION include wireless N networking, Blu-ray disk and larger hard disk size up to 1TB.